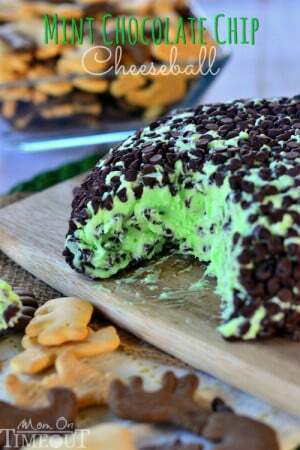 These Chocolate Mint Cream Cheese Buttons are perfect for all occasions! 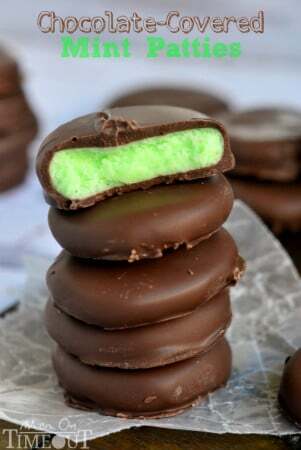 Lovely mint flavored cream cheese mints filled with a decadent chocolate ganache. Guaranteed to be a hit with your chocolate and mint loving friends and family! To tide you over, and in preparation for St. Patrick’s Day, I thought I’d share this easy candy recipe with you today. It’s a cream cheese mint filled with chocolate ganache. These little mints are a hit at parties and are crazy easy to make. This recipe makes a whopping 6 dozen candies so there’s plenty for a crowd. I like to make them really small – bite-size really. I usually about a teaspoon of the dough for each mint. Scoop a level teaspoon to ensure the mints are all the same size. I’ve made these before and just popped a Hershey’s kiss in the center. Fun and easy. Even better, however, is this version where I make a little indention and then fill it with ganache. I mean, everything is better with ganache, amiright? You could keep the mints white if you prefer to not use food coloring. I like to make them green so my guests know that they are mint-flavored. I don’t go overboard though. Gel food coloring is best here because it doesn’t add too much moisture to the dough. Speaking of mint flavored, I do mean MINT, as in spearmint. Not peppermint. I’ve done that before and in those cases, I color the candies pink. I’m a stickler like that. I’ve made a quick video to show you just how easy they are to make! You can check it out here. Super fun and the kids can help too! I am totally in love with all mint and chocolate flavored treats – they’re my favorite! 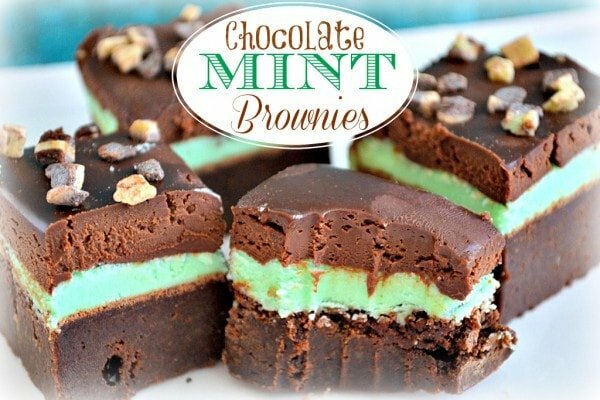 Make sure to check out some more recipes with this awesome flavor combination like these Chocolate Covered Mint Patties or these Chocolate Mint Brownies or perhaps this Mint Chocolate Chip Cheese Ball. Combine cream cheese and one cup of powdered sugar in a large bowl and use a stand mixer or hand mixer to combine. Add the extract and gel food color and mix until combined. Scoop out a teaspoon of the dough and form into a ball using the palm of your hands. Place it on the prepared baking sheet. Repeat with the rest of the dough. Use the end of a wooden spoon or a small measuring spoon to create indentions in each bowl. Dust the measuring spoon with powdered sugar if it sticks at all. Chill the mints until firm, about 1 hour. Place chocolate chips in a heat-proof bowl or large measuring cup. Bring heaving whipping cream just to a simmer and then pour over the top of the chocolate chips. Stir once or twice and then let sit for 2 minutes. Continue stirring until the chocolate is fully melted and incorporated. Transfer the ganache to a ziploc bag and let it set for 30 minutes or so until it has thickened up - think yogurt consistency. You can speed up this process by placing it in the refrigerator but keep an eye on it or it will get very firm. Cut the corner off of the bag and pipe the ganache into the center of each mint. Chill for about an hour, or until the ganache has set up. 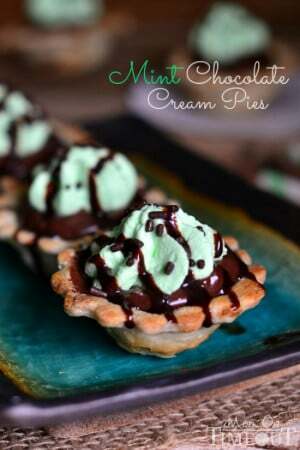 More mint and chocolate desserts! For all bars recipes, go HERE. I made these for the first time today.. Recipe was Perfect. For those having consistently problems maybe the cream cheese is too warm or not enough sugar. Definitely use your hands to mix. Also you can add liquid food coloring but knead it in on a surface with powdered sugar on it so keep it from becoming too wet. Can the dough be made ahead of time and refrigerated until the next day then rolled out and filled? I also can’t get the ingredients to the consistency of the video. Everything is combined and even when I used my hands it is a wet sticky mess. I added sugar gradually and followed instructions but there is no way this is a doughy texture, can’t form them at all. What else could be done? I used all the sugar. Have you tried with a different flavor? I was thinking about raspberry with a Hershey kiss? 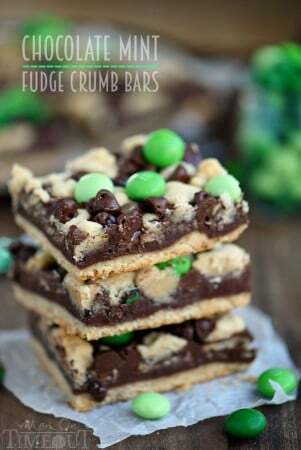 Just made these for Christmas and had no trouble at all with the recipe as is. I used a teaspoon to measure each one and got about 55 pieces. I did have a lot of ganache left over, did, lol. Thank you, these are so cute on my cookie trays.